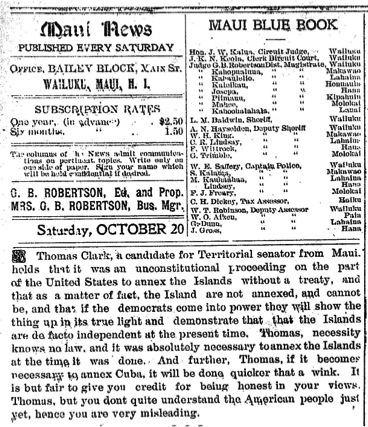 On October 20, 1900, the Maui News published a commentary by its editor, George B. Robertson, that focused on Thomas Clark’s candidacy for Territorial senator from Maui. Thomas Clark was a British subject who applied for naturalization with the Minister of the Interior and was granted Hawaiian citizenship on December 23, 1867. Thomas Clark was from Wailuku, Maui, and he was a signatory on the 1897 Hawaiian Patriotic League’s Petition against Annexation. He was 42 years of age when he signed the petition on page 245, September 11, 1897. You will notice next to his signature is written “Hawaiian” because Thomas Clark, although formerly British, was a Hawaiian subject. 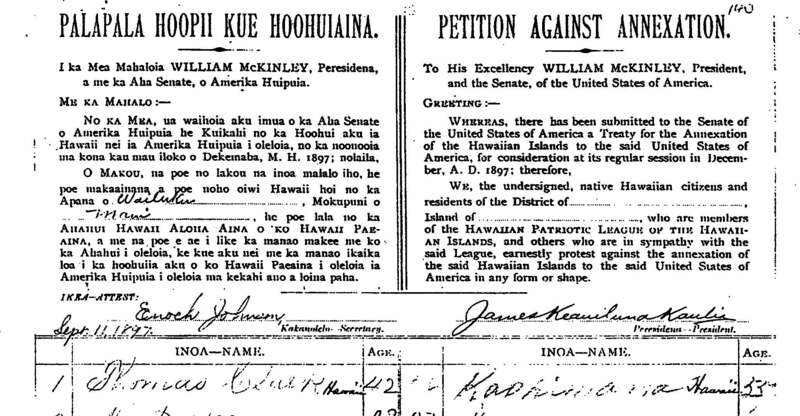 The reason for the petition was because on June 16, 1897, President William McKinley signed a treaty of annexation with insurgents from Hawai‘i and was preparing to submit it to the United States Senate for approval when it reconvenes in December 1897. McKinley ignored the June 17, 1897 diplomatic protest from Queen Lili‘uokalani, and the July 24, 1897 protests from the Hawaiian Patriotic League (Hui Aloha ‘Aina) and the Hawaiian Political Association (Hui Kalai‘aina). This resulted in activating the Hawaiian Patriotic League and the Hawaiian Political Association in order to gather signatures from the people. According to the 1890 government census, the national citizenry numbered 48, 107. The Patriotic League gathered 21,269 signatures and the Political Association gathered 17,000. The two organizations agreed to only submit the Patriotic League’s petition because the Political Association’s petition could be viewed by the Senate as too pro-monarchy. The Patriotic League’s Petition was entered into the record of the United States Senate by Massachusetts Senator George Fisbie Hoar when it convened in December of 1897. As a result of these signature petitions, the Senate could not garner 2/3’s of the Senators to ratify the McKinley treaty. By March the treaty was dead. On July 7, 1898, a joint resolution of annexation was signed by President McKinley purporting to annex the Hawaiian Islands justified as a war measure, but Congressional legislation has no force and effect beyond the borders of the United States. (See U.S. State of Hawai‘i is a War Crime under International Law). Thomas Clark knew this. Propaganda was effectively used to disguise the occupation of the Hawaiian Kingdom as if the Hawaiian Islands were annexed by a treaty and made a part of the United States. Thomas Clark knew the Hawaiian Kingdom was still independent, but propaganda did not spare the generations after. Kupuna told us about that. Has anyone posed the question to them today? Mahalo. Part 2…Not that we need their confirmations…if you connect the dots…the article was written in 1900 and even after the writing of the second Executive Agreement in 1897…when Hawaiʻi is an independent state…then this article exposes more about the fact that Hawaiʻi remains an independent state today? That is clear to me. Mahalo. With all due respect, in order to uphold. promote and preserve the sovereign powers of authority of the Treaty Signatories party to the Treaty of 1875 being on the part of the original indigenous peoples of the Hawaiian Islands (Sandwich Islands) His Majesty King of the Hawaiian Kingdom-Hawaiian Islands and to his heirs the people who by blood have rightful powers passed on down to them by inherent right I offer as a friend and ally these words of support;- If the man spoken of here in this article is not a Hawaiian Native by blood then he is not Hawaiian at all and could be viewed as an agent provocateur sent to cause confusion and to position himself by the Crown of Great Britain-United Kingdom-England note the word “Subject” which would could be viewed as an attempt to use the UNION JACK in the upper left hand corner of the flag and to subjugate the Natural Hawaiian people under the rule of Great Britain as a PFC-Private Foreign CORPORATION, just like they had done time and time again to so many good and peaceful loving civilized Nations of the world in the past. The Hawaiian Kingdom’s Independence has already been proclaimed in Europe and it was stated that, “no protectorate is needed”, so therefore they do not need us-the rest of the world to watch over them and tell them what to do. The Hawaiian Kingdom has a Treaty Of Reciprocity with the United States of America, and I have seen the original book from the Navy Department which I gave to Ali i Nui Aleka Aipoalani and also a Certified Copy of the Treaty as well for his people to see that it is real and still valid. It is a great honor to help the Hawaiian Peoples and in helping them today also helping their ancestors to participate in the corrections of today for the enjoyment of all of their future generations to come. Sgi Wado Aho and Mahalo “Thank you” for the opportunity to serve for this purpose and look forward to a long lasting peace, by resolving issues of conflict, healing the breach of peace, maintain peace through their peace agreement being mutually acceptable to all parties involved being concerned that a final settlement of these matters is a necessity to reaffirming a more permanent peace in order for the future generations of the Hawaiian peoples prosperity and preservation of nature and in protecting the Islands for the world to be able to also see the beauty of the people and their culture intact for all time as we know it, and for as long as this earth remains. Sgi Wado Aho and Mahalo “Thank you” Go i ga Nigada Dvnada-dudalv Nvwatohiyadv “Take care and Peace To All Our Relations”. My interpretation of this statement, “part of the United States to annex the Islands without a treaty, and that as a matter of fact, the Island[s] are not annexed, and cannot be, and that if the democrats come into power they will show the thing up in its true light and demonstrate that…the Islands are de facto independent at the present time.” As of 1887 the Hawaiian Kingdom had 30 foreign Treaty Relations with different countries 4 of which was with the United States of America. The first in 1826, second 1849, third 1875, Treaty of Reciprocity, and the fourth in 1884. Those Treaties were agreements with the United States, to exchange goods etc. and granting vessels to enter Pearl River Harbor and other ports in the Hawaiian Kingdom. None of which had anything to do with the Treaty of Annexation ceding the Hawaiian Kingdom to the United States. Uhh, the king oh atooi you reference! Boogus, you’re been robbed and defrauded by a fictitious Kingdumn! I see you have proved me right in my assessment of Reverend?? ?Malama Robinson. It is ridiculous for HK spokesperson to say they do not yet understand american people just yet…. their M.O. has gone out to the ends of the earth quite clearly, and it stinketh! They will answer to the Lord as the Queen prophesied. HK spokesperson (twitter) is not the person who said that sentence it was between Thomas Clark and the Maui newspaper, George B. Robertson in the article. Mahalo NUI for clarifying that…. we are in One Accord then! This October 20, 1900 article is pretty simple to comprehend. Thomas Clark is defending the sovereign independence of the Hawaiian Kingdom as a national of the Hawaiian Islands against the Maui News editor by clearly stating that the HK cannot be annexed without a treaty. Thomas Clark had the smarts to know that a U.S. Joint Resolution, an internal U.S. public policy, has no effect over another independent country, the Hawaiian Kingdom. The Maui News editor (George B. Robertson) on the other hand defends what the U.S. did to the Hawaiian Kingdom by stating it could do the same to Cuba if it needed to. Strong words used by the news editor that “. . . necessity knows no law, . . . ” but as we all now know is misplaced! No treaty = no cession! Thomas Clark was dead on!! Section 432 Every foreigner so naturalized, shall be deemed to all intents and purposes a native of the Hawaiian Islands, be amenable only to the laws of the Kingdom, and to the authority and control thereof, be entitled to the protection of said laws, and be no longer amenable to his native sovereign while residing in this Kingdom, nor entitled to resort to his native country for the protection or intervention. He shall be amenable, for every such resort, to the pains and penalties annexed to rebellion by the Criminal Code. And every foreigner so naturalized, shall be entitled to all the rights, privileges and immunities of an Hawaiian subject. My great-great grandfather, C. B. Maile, signed the same petition against annexation for Oʻahu. I have a .pdf version of that signature page as well as the text of the memorial sent to McKinley. Mahalo no ke kū ʻana ma ka pono kaulike.